Sally Spencer, faculty in the College of Education, presented a demo of CSUN Simulation Services to faculty in the Department of Social Work. Photo by Lee Choo. At this year’s California State University, Northridge eLearning Showcase, faculty demonstrated how technology can enhance the learning experience of students in the classroom. Presentations included Abraham Rutchick’s Hybrid 2.0: Real-time Online Section (ROS), Kaitlin Bahr’s BioStatsBuddy app and Sally Spencer’s Interactive Simulations: Bridging the Gap Between Course and Career. In this series, CSUN Today profiles each of these projects. This story dives into Sally Spencer’s Interactive Simulations: Bridging the Gap Between Course and Career presentation. At the fifth annual eLearning Showcase earlier this year, eight California State University, Northridge faculty members presented their ideas to increase students’ quality of education. Professor Sally Spencer, of the Department of Special Education, presented Interactive Simulations: Bridging the Gap Between Course and Career. Her presentation focused on the CSUN Simulator, a program that uses “mixed reality” to allow students to practice skills such as teaching, counseling, social work and journalism, in a virtual environment. Although the program, formerly known as TeachLivE, has proven valuable to numerous CSUN departments, Spencer said the technology is so rare that other universities may pay CSUN to use it. Mixed reality merges real and virtual worlds to produce an environment where physical and digital objects coexist and interact in real time, providing a realistic simulation that cannot currently be replicated by purely virtual systems. 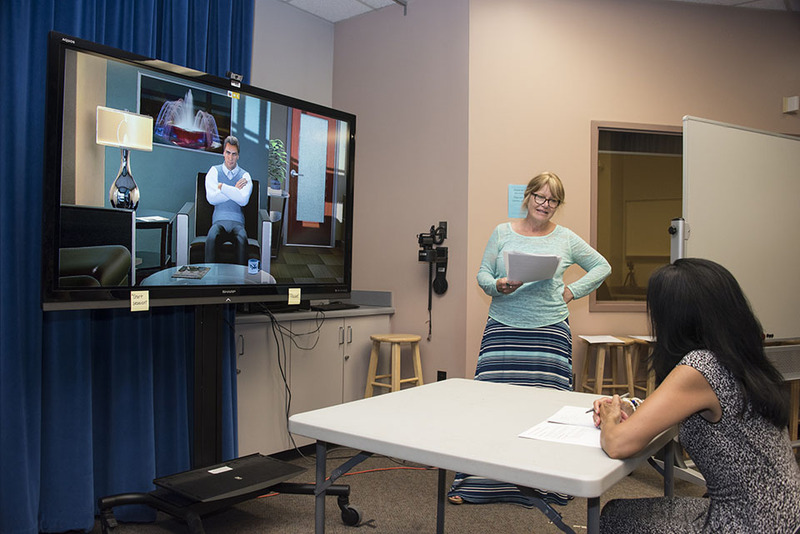 While in a lab or classroom, a student sits in front of a television with a life-size avatar on a large screen. The simulator uses a combination of artificial intelligence and a live person to allow students a real-life experience without real-life consequences, Spencer said. According to Spencer, CSUN purchased a license for the simulator in 2016 and is now able to serve as a service provider. This means faculty can “rent out” the simulator to other universities, creating revenue to help fund use of the simulator in other courses at CSUN. “We want to work with other universities who pay us to use the simulator, so that we help fund the CSUN students,” she said. The CSUN Simulator was created more than a decade ago by faculty at the University of Central Florida. Spencer had been using the simulator since 2012 and said she decided to incorporate the simulator in the classroom as a new way to get current and future teachers to practice their craft. However, at first, she didn’t realize the potential of the simulator and its significance in other fields. Now, CSUN faculty are using the technology in 14 courses, throughout the Michael D. Eisner College of Education and across six different departments, including journalism and cinema and television arts. Spencer said she hopes to expand the use of the simulator to even more classrooms at CSUN, and she plans to offer it to campuses nationwide. 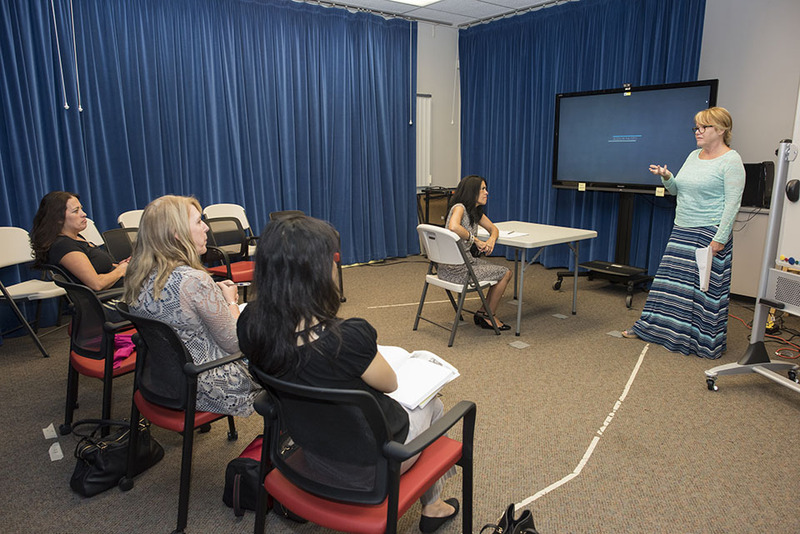 Diane Gehart, a professor in the Department of Educational Psychology and Counseling, used the CSUN Simulator for the first time in the spring. She said students and teachers alike reacted positively to the simulator. Spencer hopes to bring this simulator, called CSUN Simulation Services under CSUN’s license, into as many classrooms as possible, to transform the education CSUN students receive. For more information on how to incorporate the simulator into courses, please email Sally Spencer at sspencer@csun.edu.